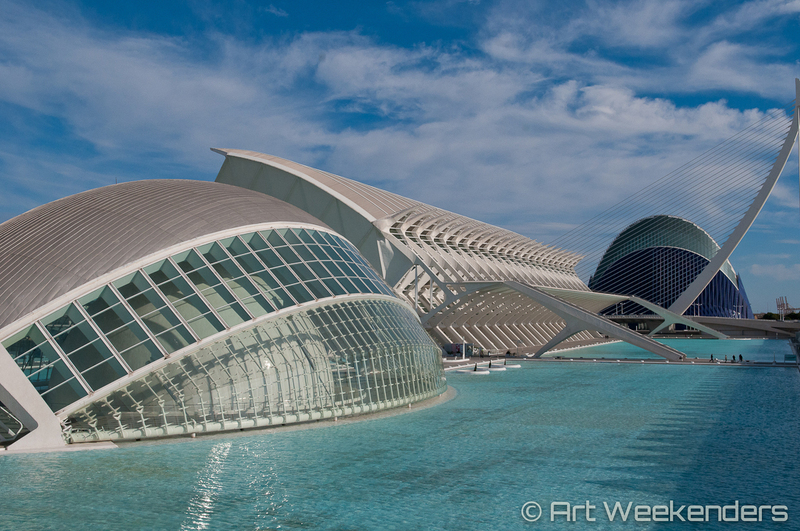 Valencia’s Ciudad de las Artes y de las Ciencias looks like something you’ve never seen before. It is a dreamlike area sprinkled with the most fantastic architectural creations. The whole complex feels like being brought here from the future. It is in fact a legacy of a recent past, from the early 1990s. Of a past of better times, admittedly, from the days when the economy of Spain was riding on the waves of optimism and it felt like the country just never would stop climbing into an ever brighter future. 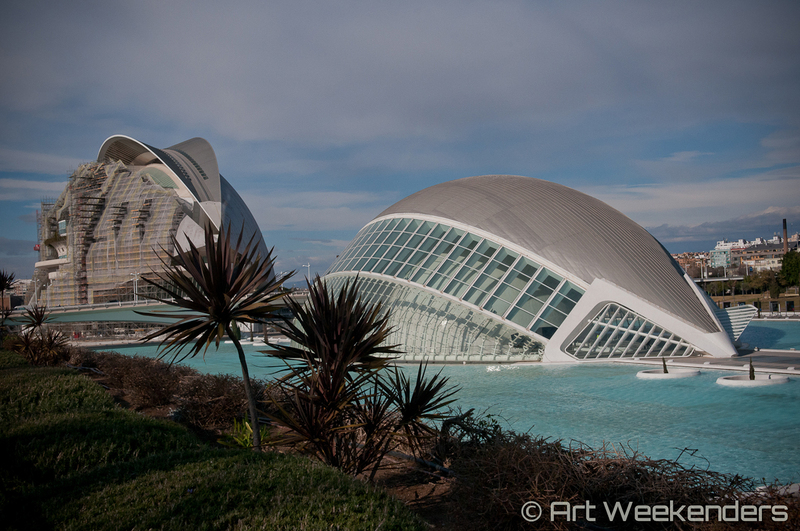 Valencia was somehow the city with some of the clearest plans. Here the plan was to create a mini-city around art and entertainment. Although times have changed since the plans for Ciudad de las Artes y de las Ciencias first were drawn up, the result is there for us all to admire today. It is a great experience, a place we warmly recommend to visit. The City of Arts & Science was a controversial project from the beginning. Not everyone was positive about the grandiose plans – and that sentiment still exists. 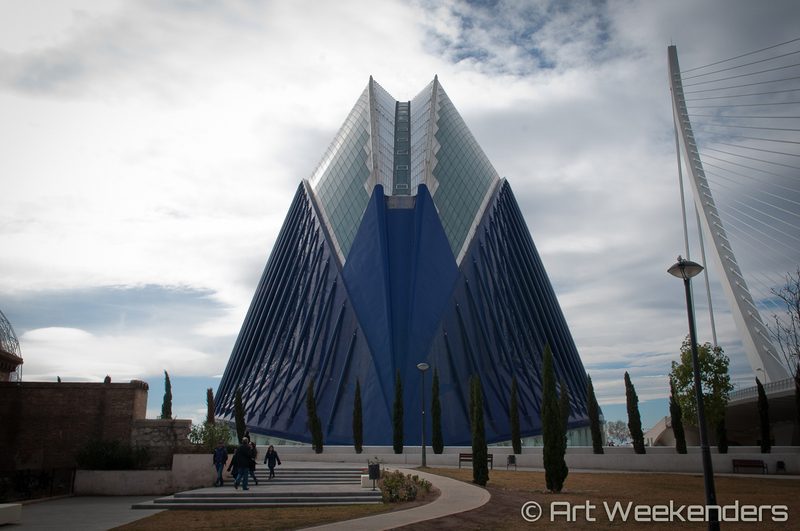 We already covered the controversies around the project and its architect Santiago Calatrava, but now we also had the chance to see for ourselves what the fuss really is about. Yes, it is amazing, and yes, it is a bit bewildering, and yes, sometimes you could wonder what its future will look like. One thing is in any case for sure: visiting it is a fantastic experience and it is a great place for photographers. We spend hours wandering around, and since we visited in low season we were almost entirely undisturbed. While walking among the buildings of the park, we found it impossible not to draw parallels to Brasilia, the capital of Brazil. Brasilia was planned and built by the late Oscar Niemeyer and many of its landmarks gave a similar feel as here in Valencia’s mini-city. 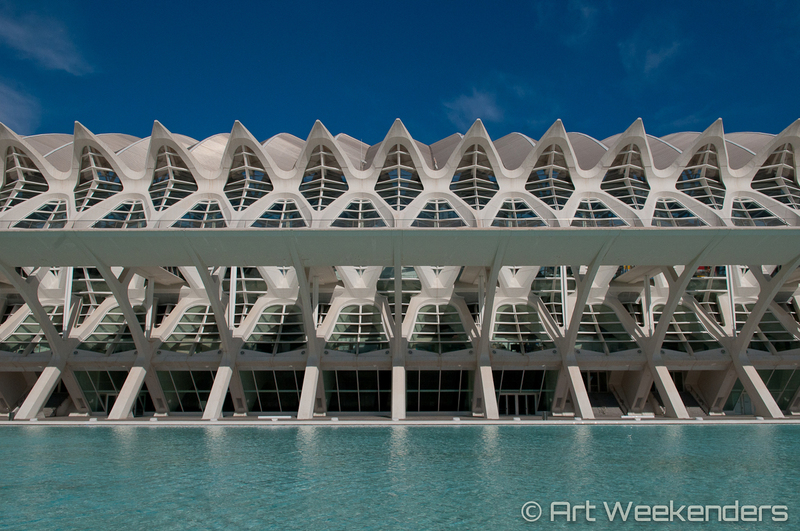 The Valencian architect Calatrava came with his plans some forty years later after Niemeyer’s though. While it is easy to see the connection, despite the similarities the two projects also feel different. The inspiration for the mini-city – given its science focus – is drawn from the world of nature. While wandering around you will soon enough realise that what looks like buildings, are in fact giant bugs. It might take a while to come to terms with it, but once we saw it, that is all we could think of. Almost in the heart of the mini-city L’Hemisferic was the building inaugurated first of them all, already back in 1998 while the rest of the site around was still under construction. Surrounded by water to all sides, the building is possible to open up, just like an eye with eyelids. The floor of the pool is made of glass, also playing on the eye-resemblance – and also what makes the reflections so fantastic. Looking at it from a distance, it looks more like a bug, if you ask us. 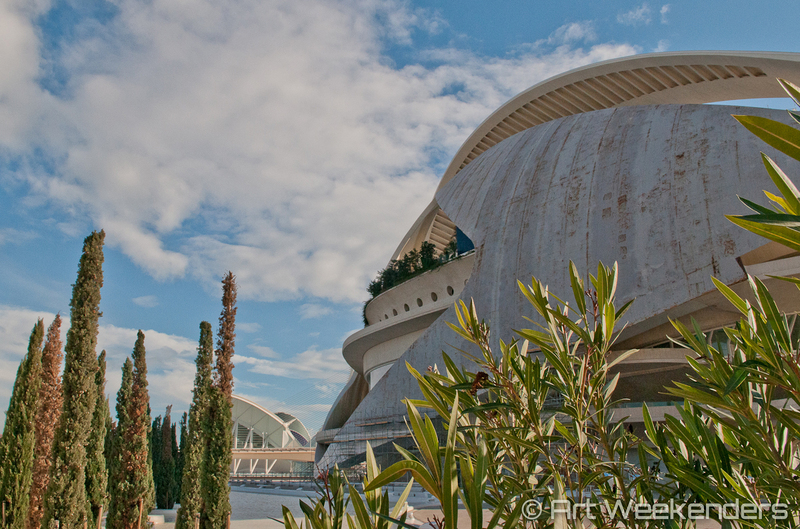 The Hemisfèric functions mainly as a planetarium, but also houses an IMAX cinema. There is also a (basic) restaurant inside, which on a Monday afternoon in wintertime felt very empty. The interactive museum of science occupies around 40,000 m² over three floors and was inaugurated in 2003. While it is supposedly a museum, the value of it is more for entertainment purposes than for serious scientific studies. Nonetheless, it remains a popular attraction. Oddly enough, the city’s basketball team is housed in the building as well, playing on the first floor of the building. 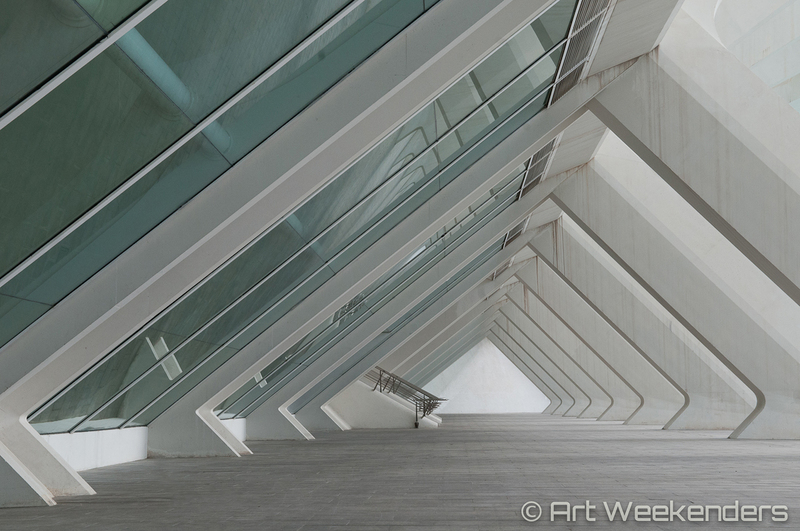 The exhibition space of the museum is the largest in Spain and the building is architecturally known for its geometry, structure, use of materials, and its design around nature. 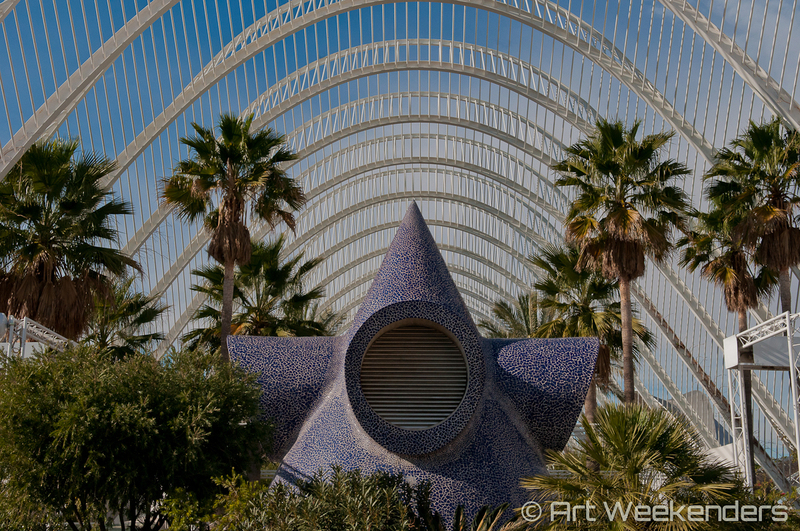 Opposite the science museum and at an elevated position facilitating great views over the rest of the complex, the Umbracle is an open-air botanical exhibition space. The long, landscaped walkway also houses in its interior ‘The Walk of the Sculptures’, with contemporary sculptures by famous names such as Francesc Abbot and Yoko Ono. The “sculptures of nature” – the plants – are all local examples representing the region, arranged in such a way that each season will feel enriched by their colours. 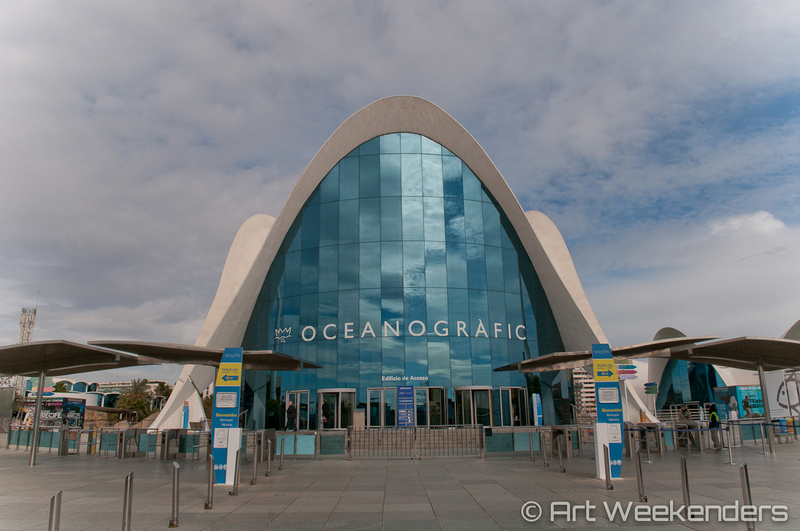 This is the largest oceanographic park in Europe, opened in February 2003. 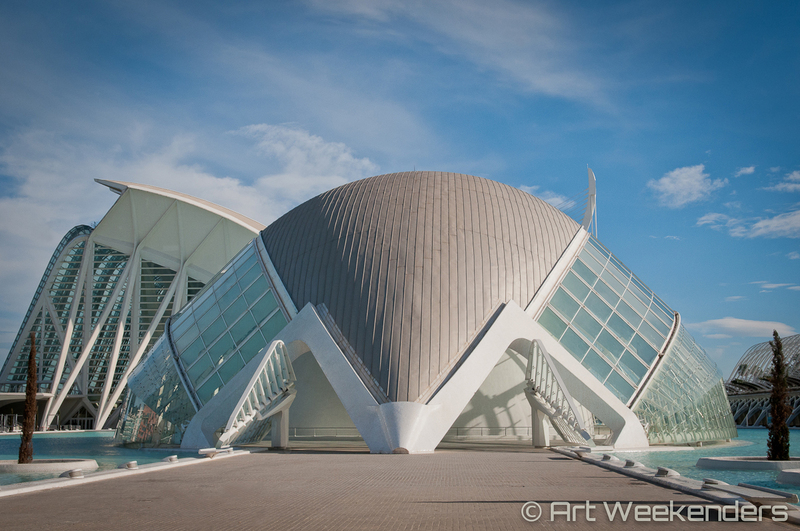 Unlike the other buildings, this isn’t a work of Calatrava, rather of Felix Candela. The park is located at the eastern-end of the park, divided from the rest by a highway. It is divided into ten different sections and you can see sharks, penguins, dolphins, sea lions, walruses, beluga whales, and more here. The newest addition to the complex is the Agora, inaugurated as recently as in 2009, and used for concerts and sporting events. The elliptic shaped, purple-tiled building is some 80 metres high and takes up to 6,000 spectators, depending on the hosted arrangement’s set-up. 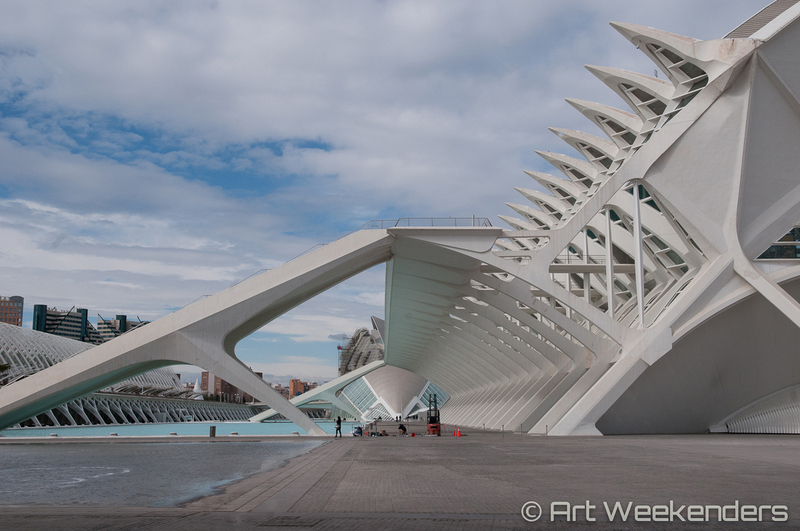 This is also the work of Santiago Calatrava. Just next to the Agora passes the highway across the newly built bridge, which forms a link between the two parts of the park. This is a suspension bridge and it happens to be the tallest structure in the city with its 125 metres. What you can’t see, is the planned project of three skyscrapers, the towers of Valencia. The Torres de València will likely never materialise though. Given all the problems and financial struggles the city faced due to the mini-city (and otherwise), it is very likely that nobody will ever see even the shadow of the three planned skyscrapers, where the tallest was planned to be 308 metres. Like to see more of Valencia, check out our Valencia street art post here: Valencia’s Street Art Scene .